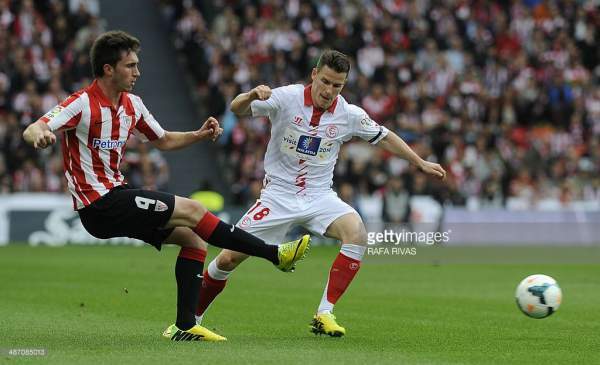 Sevilla FC vs Leicester City Live streaming information: Sevilla FC hosts the Premier league title defenders Leicester City for the first leg of the Round of 16 stage of the Champions league at the Ramon Sanchez-Pizjuan. Sevilla FC plays in the Spanish Primera Division and are currently third on the table with 49 points from 23 games, two points below Barcelona and four points above Atletico Madrid. On the other hand Leicester City are currently 17th on the table with 21 points from 25 games, one point above Hull City and one point below Middlesbrough. Sevilla FC are the Europa League winners of last season and are going strong in this season Champions league as well. They are currently third in the league with 49 points from 15 wins, four draws and four losses, scoring 46 goals and conceding 28 goals in total. Ben Yedder and Aduriz are their joint top scorers with eight goals each. This will be the first competitive game between the two sides. Sevilla has lost three of their four Champions league games against a English side. Their form in the league is good as they have won four and drew one in their last five games in the league. They played against Eibar in their previous game of the league and won the game by 2-0. Leicester City are going through a tough stage as they are currently just one point above the relegation zone in the league with just 21 points from five wins, six draws and 14 losses, scoring 24 goals and conceding 43 goals in total. Riyad Mahrez is their tops scorer in the Champions league with four goals to his name. Leicester City are the first team since Malaga to finish top of their group on their Champions league debut. They recently got knocked out of the FA Cup by the league one side Millwall by 1-0. Sevilla FC are in good form and can win this one easily.